Janet Adelman, in her psychoanalytic approach to Hamlet, studies the role of Gertrude, Hamlet's mother, in the play. However, she starts by explaining how Hamlet fails to identify with his idealised dead father. Contrasting himself to Old Hamlet and doing the same with Claudius, his stepfather, makes him by extension associate himself with Claudius. Psychoanalysts take great delight in uncovering layers, some would say constructing layers, within literature and Adelman sees this conflict as a mere superficial layer. She moves on to examine the idea of the contaminated female body in Hamlet. She uses the soliloquy in act 1 scene 2 (1.2.129-159) as a symbolic manifest, dividing the father figure into a positive sun god, Old Hamlet and a negative, incestuous satyr, Claudius. Then, likening Gertrude to an unweeded garden, the queen or rather her sexuality becomes the grounds for comparison for Hamlet, Adelman claims. The soliloquy is the textual evidence for Adelman's theory that the conflict in the play is more about the mother's remarriage as a vehicle of her sexuality than the loss of a father. The idealised father and Hamlet then become products of Gertrude's sexuality and the play proceeds with Hamlet's efforts to desexualise his mother, thus freeing himself and his father from her corruption. It is also worth noticing how her sexuality becomes synonymous with death; it lead to the death of Old Hamlet, Hamlet himself is its product with the terminal implication of origin and Old Hamlet's death also kills Hamlet's identity and leaves him in the power of his mother. Death becomes the sexualised Gertrude's legacy to her son. However, the idealised father also played a role in relation to this sexuality. Adelman's response to this is to point out how Hamlet deflects the guilt of the father figure on Claudius while attributing most of the positive aspects to Old Hamlet. Later in her article, she also points out how Old Hamlet supposedly was able to control her sexuality (referring to the same soliloquy), making life livable for Hamlet. Therefore, the presence of the sexualised mother threatens the ideal of the idealised father being in control. Furthermore, it threatens to eliminate the oppositions between past and present, Old Hamlet and Claudius (both being subject to her sexuality) and the virginal image of Old Hamlet's wife and the "unweeded garden" of Claudius' wife. Finally, Hamlet's obsessing over Gertrude's appetite liken him to Claudius, the negative father image. QUEEN GERTRUDE: O, what a rash and bloody deed is this! HAMLET: Ay, lady, 'twas my word. 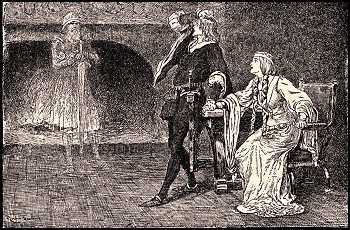 Hamlet initially fears the male under the power of a female and therefore withdraws into his antic disposition, an introvert mode of existence where he, the male and (ideally) the image of the idealised father, is in control and able to effectively impact the world around him without being affected. The main threat, according to Adelman, is Gertrude as she is the only sexualised female in the play. Her role is as a part of Hamlet's psyche (the other) with which he must come to terms. This is done in the closet scene where Hamlet gets Gertrude's seeming assent to stay chaste and honour Old Hamlet's memory. 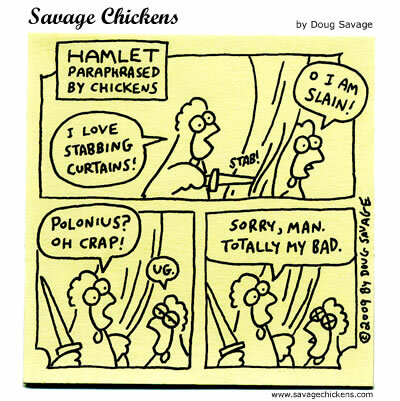 When this is done, Hamlet can focus on his real objective, the revenge. He has remade his mother, "ended" her sexuality and thus brought both his father and himself to prominence, displayed on stage as the Ghost leaving, supposedly for heaven. Adelman claims that the objective of revenge had been secondary to the objective of reform throughout the play. This is exemplified through the play-within-the-play, which seems more suited to catch the conscience of a queen rather than a king, and also to the fact that the opportunity for revenge in act 3 scene 3 is presented as a minor digression in the play. Also, it seems that Hamlet is unable to act and come to terms with his situation until the point where he resolves his issue with Gertrude. Whether or not she is actually reformed is not clearly stated, but the play is ambiguous enough to at least suggest so. This psychoanalytic criticism of Hamlet exemplifies in my opinion the best and the worst aspects of psychoanalytic literary criticism. It wonderfully expands the characters and the relations between them. It helps us investigate motivations and inhibitions and discover patterns of behaviour. However, it uses prefabricated theoretical structures and imposes them on the play, sometimes with minimal texual evicence. At times, the textual passages referred to are so open to interpretation that any approach would be able to build a case on them. In this case, the image of the unweeded garden is a minor metaphor of with a number of possible signifieds, and it is an image which is not repeated in any form which cannot be linked to a number of other images. It thus forms a large theoretical structure on an inconsistent and insufficiently broad basis. In this way, the article can be seen as providing much of its own fundament, building theories on theories and drawing conclusions from its own conclusions. There is, for instance, nothing in the text's imagery, characteristics and plot to justify the statement that "the mother's body brings death into the world because her body itself is death" (p.271). This is a product of psychoanalysis rather than a thorough reading of the text. Also, the theory that Hamlet's accusing his mother of active murder is a bit far fetched, as the textual evicence points towards another meaning. The Ghost had told Hamlet that "the serpent that did sting thy father's life Now wears his crown" (1.5.38-39) and to leave his mother alone. Bearing in mind that Claudius has now entered Hamlet's consciousness more urgently as he thinks he is the one dead behind the arras, it is highly unlikely that Hamlet would be unclear as to the mother's role in the murder. The role of the player queen in the play-within-the-play further argues this point. It is more probable that "as kill a king and marry with his brother" is a simple postulation of the royal couple's individual crimes. Here, psychoanalytic criticism builds itself a theory so alluring that it obscures what is actually stated in the text. Finally, the central theory of the reform of Gertrude could simply be nothing but a generical requirement. Hamlet being a tragedy, Gertrude could not die a "bad" woman. That would lessen the effect of her death. The fact that one could come up with an alternative, valid theory to explain the necessity of her reform in such a simple stroke is a testimony to the artificiality of much of psychoanalytic criticism. Good Job :) I like this. Thanks! A personal favourite of mine. Glad you like it! can i take some extracts to use it as an argument?? If you don't mind i need to know some information about you sir !! Of course you can, Jihane! Contact me on thetaleofsirbob@hotmail.com and I'll help you out. Thanks for visiting my blog!